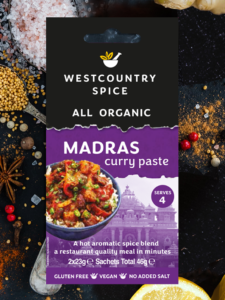 It’s easy to create an authentic Indian beef Madras curry with Westcountry Spice all organic Madras curry paste. 1) Fry beef until brown – remove and reserve stock. 2) Heat a little more oil and fry onion, garlic and ginger until the onions start to turn brown. 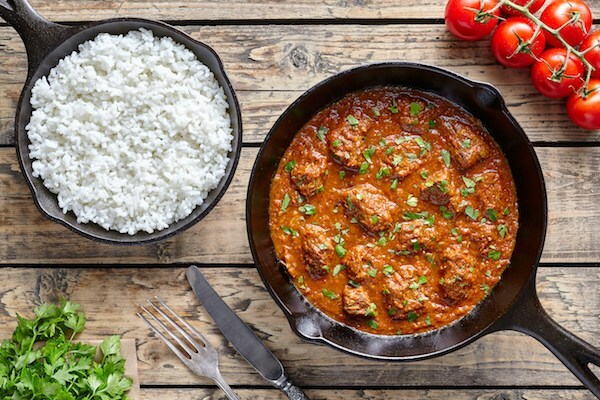 3) Stir in the Westcountry Spice Madras paste, return the meat to the pan and add the sliced tomato and the tomato puree. 4) Cook for 3-4 minutes until the meat is sealed. 5) Add stock and reserved stock and bring to the boil. 6) Simmer on low heat for 2-2.5 hours until meat is tender and liquor has reduced to a thick gravy. 7) Serve with basmati rice and poppadums.